Plum and gold invitations were taken to another level with our hardbound suede folios. We designed the invitation with gold printing and a vintage die cut shape. The inserts were held in a custom die cut pocket. Plum response envelopes were printed with gold addresses. Their Arizona Biltmore wedding was a destination wedding and the rsvp card had place to respond for multiple events. A gold medallion was molded and filled with ivory enamel and decorated with a laser cut gold metal monogram. 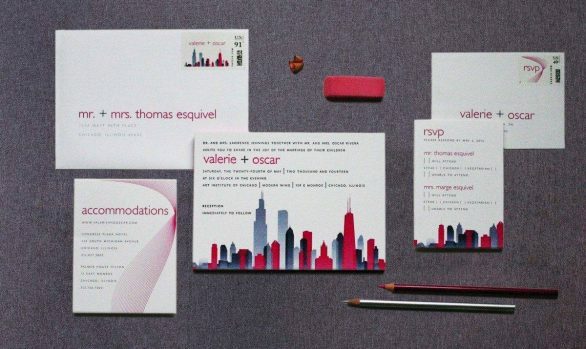 Each mailer box was die cut and addressed with the addresses in a matching plum ink.